Volunteers are needed to stocks shelves and assist clients with food selection as they shop in our on-site food pantry. Each day that we're open, we typically serve between 300 and 400 households. 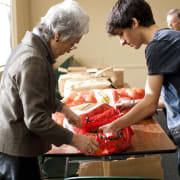 Interested volunteers can view available shifts and sign up directly online at gleaners.volunteerhub.com! You can volunteer once or multiple times - whatever your schedule allows!